My apologies to baseball fans, both of you. The "judge" in today's case is this morning's CPI (Consumer Price Index) data. 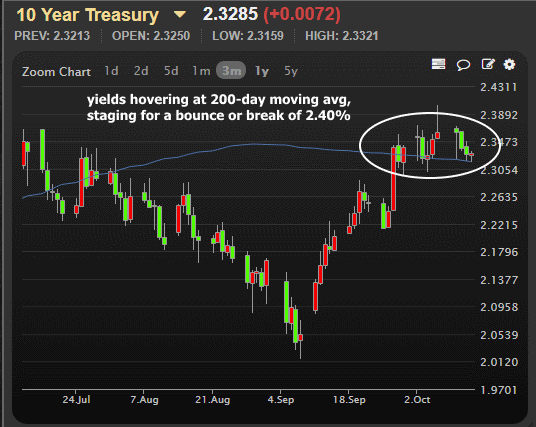 Bonds have been deliberating all month about whether to make an attempt to break above 2.40% or bounce back into the confines of the range that's dominated the past 6 months. On the plus side, yields quickly backed down from their first run at 2.40%, but on a negative note, they've thus far refused to move back below the 200-day moving average (or "the low 2.3's," if you prefer). This morning's CPI data isn't necessarily the be all, end all determinant of bonds' next move, but for several months, it's arguably been the biggest motivator in terms of economic data. Reason being: it's the last piece of the puzzle for the Fed. The labor market is already firing on all cylinders, based on the official numbers anyway. But inflation has been recalcitrant. This has been especially noticeable since the summer months with core year-over-year CPI running at 1.7 ever since June (after revisions). That's 4 straight reports with a number the Fed would like to see at 2.0%+ instead hovering at 1.7%. If the next move is higher instead of lower, it would count as a potentially big symbolic shift toward the Fed's promise of transitory inflation weakness. The impact wouldn't necessarily be huge with a small beat, because markets are already expecting a 0.1% uptick to 1.8%. Markets may also be willing to forgive some of this uptick due to price pressures created by the two major Hurricanes. If CPI can't render a conclusive verdict on its own, Retail Sales and Consumer Sentiment (with its "inflation expectation" components) have a chance to chime in as the jury. With 10yr yields at 2.329% to start the day, bonds are probably safe from the executioner today. That doesn't mean they can't sell-off, just that they're not likely to stampede above 2.40%. As long as that continues to be the case, we're still waiting for the next move.